The 1700 hectare Pukenui/Western Hills Forest is located on the doorstep of Whangarei City. Numerous tracks link Whangarei District Council and Department of Conservation administered land which includes the Coronation Scenic Reserve, Pukenui Conservation Park, Whau Valley Water Supply Reserve and Whangarei Quarry Gardens Recreation Reserve. Walks range from 30 minutes return (Rust Track) to 8 hours (Amalin Drive to Russell Road) showcasing a beautiful array of native vegetation with some impressive mature trees, picturesque streams and a variety of forest birds. The forest complex is steeped in history with Maori pa sites and storage pits, a deserted goldmine and remnants of former logging operations to be seen. Several places worth visiting, found at the start of the tracks, are the Quarry Craft Centre (off Selwyn Avenue) and the Whangarei Quarry Gardens (off Russell Road). Please keep to the tracks marked with orange triangle markers and respect private property. No dogs, camping, fires or bikes are permitted and remember to take only photos and leave only footprints. The first section of this track is an easy walk, suitable for all ages. To complete the full loop, a moderate level of fitness is recommended. From the car park, access to the forest is through open farmland displaying some attractive dry stone walls dating back to World War II. Once over the stile, this walk takes you along the edge of the forest past regenerating native vegetation. Tomtits are often sighted here and the delightful song of the tui can be heard as the track enters the forest. An old forestry bullock track leads you down to the beautiful Mangere Stream where there are some good picnic spots. There are some steep hills to climb which return you to the bullock track and along the fence line to the stile. Large kauri and totara, native orchids, and a range of forest types feature on this track. A moderate level of fitness is recommended for this track. Taraire is the predominant tree on parts of this track. From the forest entrance at the stile, this track takes you down to a stream crossing, with a steep climb up the Taraire Ridge to a junction with the Main Ridge Track (see below). The Taraire Ridge Loop Track continues down to the Mangere Stream, where there are some good picnic spots, and links with the Pukenui Forest Loop Track. The way out involves a steep hill climb to an old forestry bullock track and along a fence line back to the start. A high level of fitness is recommended for this track. 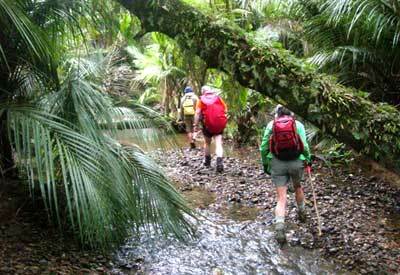 There are four walking tracks that are maintained by Whangarei District Council within the Coronation Scenic Reserve. All the times and distances given are for walking them one way only. From Selwyn Avenue, go into the Quarry Craft Centre. The grass car park is on the right and the track begins behind this and is signposted. This track is surfaced and there are numerous steps and board walks. After about 300 metres, there is a 125 metre track that goes to a Maori pa site, where there is interpretation information. The track continues up to meet the Frank Holman Memorial Track at the ridge. From Kauika Road West (off Wilson Avenue), cross over the footbridge into the reserve and onto the beginning of the Frank Holman Memorial Track. Turn left following the edge of the reserve before heading up the hill. This is quite a steep climb that can be slippery when wet as this track is not surfaced. There is an impressive stand of mature native trees to be enjoyed on the way up. At the summit, there is an option to take the Kauika Road Link to form a circular walk, by turning right. Straight ahead, a pa site is passed by as the track passes up onto a high ridge. Follow the orange waymarks and do not be tempted to follow open woodland rides (vehicle access) onto the adjacent property. Where the track becomes surfaced, the Selwyn Avenue Link goes off where sign posted, to the right. The Rust Track goes off the right further along, just before the track zigzags down to Russell Road. From Kauika Road West (off Wilson Avenue), cross over the footbridge into the reserve. Turn to the right and then up the steep hill. There are a large number of steps and this can be very slippery when wet. About 300 metres up, there is a track to the right that goes to a lookout 180 metres along. From here, there are some impressive views over the city and harbour. The track continues up to meet the Frank Holman Memorial Track at the summit.